The smell of raspberries cooking is one of the joys of summer. 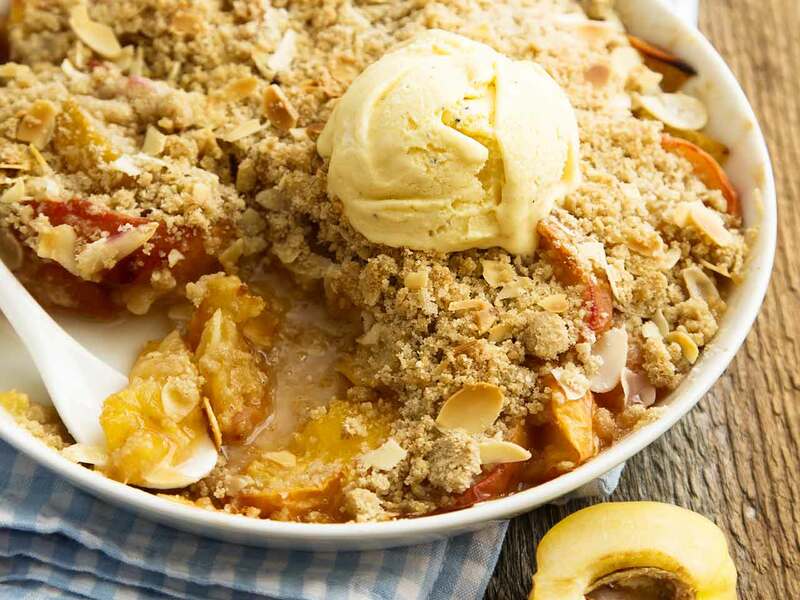 They go particularly well with peaches, and in this recipe for crumble, the juices mingle with diced peach and lime, to arrive at just the right acidity against the sugary, buttery, almond crumble. This is delicious hot from the oven with vanilla ice cream but is equally good lukewarm or cold with a scoop of rich Jersey cream. Peel the peaches and chop into sugar-lump size pieces. Toss peaches, raspberries and the lime juice together with 1 tbsp sugar. Pile the fruit into a crumble dish – mine holds 2 litres/1½ pts, is earthenware and 8cm/3in deep – and heat the oven to 375F/190C/ gas mark 5. Mix the ground almonds, flour and caster sugar in a bowl and cut the butter over the top. Quickly with your fingers rub the butter into the dry ingredients until crumbly. Spread the crumble over the fruit and bake for 35 minutes until patched with gold and the juices ooze up round the sides. Lindsey Bareham's website is www.lindseybareham.com.